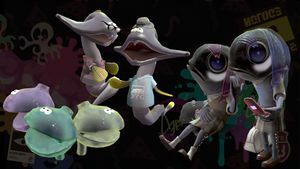 The denizens of the deep are characters in Splatoon 2's Octo Expansion. They are found in the Deepsea Metro and are based on various real-life organisms that inhabit the deep ocean. They do not interact with Agent 8 or Cap'n Cuttlefish, and may be part of a larger society of deep-sea creatures. Each species has multiple individuals, and several may be seen riding cars of the Deepsea Metro at the same time. According to C.Q. Cumber, they are not allowed to live on the surface. A sea angel, a ping-pong tree sponge, and three deep-sea jellyfish. Humanoid and much larger than their real-life counterparts, sea angels have pale blue translucent skin, through which a pink organ can be seen within their head. Their clothes consist of a red and white letterman jacket, dark gray pants, and basketball shoes similar to those made by Enperry that vary in color. In the Octo Expansion trailer in the 8 March 2018 Nintendo Direct, one is shown looking at a cell phone. They are very gentle in their normal state and are said to fly into a rage when angered, but apparently no one has the nerve to offend them. Nothing happens when they are bumped into by Agent 8, but if a sea angel is typing on a cell phone, a faint tapping sound can be heard when standing near them. The pink organ inside each one's head occasionally pulsates. Cap'n Cuttlefish and SplatoonJP refer to them with the equivalent of "he" pronouns. 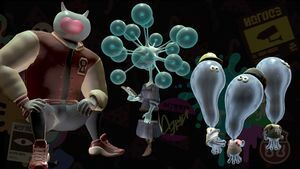 They can be found on lines F and H.
Humanoid and also fairly large, ping-pong tree sponges, specifically Chondrocladia lampadiglobus, have translucent skin in a dull turquoise and many spherical organs on long stalks branching off from their "head". They wear loose dresses in slightly varying colors and brown boots that come up to the mid-calf. In promotional images one is shown reading a book and holding a strapless handbag, but the one in the Nintendo Direct trailer only has a handbag. They are ladylike, elegant, and content to keep to themselves, but rumored to be more aggressive than they seem. Cap'n Cuttlefish and Live from Squid Research Lab refer to them with "she" pronouns with Cuttlefish additionally calling one of them "Tree-sponge girl" in one of his rap lines. They can be found on lines E and I.
Deep-sea jellyfish resemble starlet sea anemones or tube anemone larvae. They are mostly similar to their surface-dwelling counterparts, but with larger, more elongated heads and dull blue skin. They wear t-shirts with several different designs and may be seen with several different types of hats, including hard hats, baseball caps, and bell-shaped hats similar to the Tulip Parasol. One of these jellyfish is briefly seen sitting next to a gulper eel in the Nintendo Direct trailer. When bumped into by Agent 8, they make a wobbling sound and the tops of their heads wiggle back and forth. Deep-sea jellyfish may be seen sitting close together in pairs. They can be found on lines A, C, D and I. Three predatory tunicates, two gulper eels, and two flashlight fish. Predatory tunicates also bear a resemblance to jellyfish and even have similar eyes, but are clam-shaped and attached to various surfaces of the Deepsea Metro. Their translucent skin can have a purple, green, or yellow tint, and they do not wear any clothes or accessories. They are not seen in the Nintendo Direct trailer. It is unknown how they get on and off subway cars. When tunicates are present in a car, two small ones may be found on top of Cap'n Cuttlefish's hat. They can be found on lines F and G.
Gulper eels are relatively similar to their real-life counterparts but in a more human-like posture. They have dull purple skin, yellow-green fins, and large eyes similar to those of jellyfish. They wear t-shirts with several different designs and may be seen wearing hats or glasses. In the Nintendo Direct trailer, one gulper eel is briefly seen sitting next to a deep-sea jellyfish. They are described as childlike and gluttonous, in contrast with their thin appearance. They can be found on lines E, H and I.
Humanoid flashlight fish, likely splitfin flashlightfish, have bioluminescent organs beneath their large eyes (described as "eyeliner" by SplatoonJP) and strings of bioluminescent spots down both sides of their bodies. Their skin is a dark gray, and the fins on their heads are transparent, vary in color, and lay to the side, resembling hair. They wear school uniforms and loafers with socks, similar to the school-themed gear sets provided by both Inkling Girl amiibo, which can also vary in color. They may be seen carrying bags with logos on them and looking at flip phones. One with blue fins is seen in the Nintendo Direct trailer. Despite possibly being on vacation, they are described as drifting about in a lethargic state. Cap'n Cuttlefish refers "she" pronouns. They can be found on lines E, F and J. Two longsnout dogfish, a siphonophore, and a blobfish. Longsnout dogfish are humanoid and much larger than their real-life counterparts. They have pale pink skin, large green eyes, and their snouts are folded over, lessening their resemblance to real-life dogfish. Their outfits are all identical, consisting of a gray suit jacket and matching pants, a white shirt, a black belt, a brown necktie, and brown dress shoes. They may be seen with brown briefcases or newspapers; in the Nintendo Direct trailer, one is shown sitting with the former. It is suggested that they sleep with their eyes open, like most fish in real life. Nothing happens when they are bumped into by Agent 8, but a faint snoring sound can sometimes be heard when standing near them. They can be found on lines C, D, H and I.
Siphonophores, specifically Marrus orthocanna, resemble jellyfish but with multiple "heads" attached to a tall red stalk. The "heads" are a translucent blue and the body is red, matching the stalk. Instead of legs they have an outcropping of spikes, and they wear t-shirts with several different designs. Only one siphonophore is seen in the Nintendo Direct trailer. It is difficult to determine whether they are one passenger or several attached to one body, referring to the fact that siphonophores are colonial organisms, so they may be sneakily riding the Deepsea Metro on a one-person fare. They can hang using the end of their stalks and may be seen doing so on the handrails of subway cars. When bumped into by Agent 8, they make a wind chime-like sound and each head jiggles. They can be found on lines B and J.
Blobfish, humanoid and very large, are based on the bloated appearance of real-life blobfish when removed from the pressures of the deep ocean. They have pale pink skin and can wear hats, t-shirts, and sneakers. They may be seen using earbuds or headphones to listen to a portable audio cassette player, possibly based off of a Walkman. In the Nintendo Direct trailer, they are seen sitting next to a dogfish. They are described as frightening at first, but actually charming once one takes a closer look. 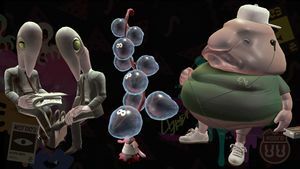 When bumped into by Agent 8, their bellies jiggle with a bouncing sound and they groan in a deep voice, which can also be heard when standing near them. Cap'n Cuttlefish and Live from Squid Research Lab refer to them with "he" pronouns. They can be found on line C.
The Japanese Twitter post describing the ping-pong tree sponge contains a play on words: 肉食系 (nikushokukei) typically refers to an aggressive personality when describing a person, but it more literally translates to "carnivore". In this case, both meanings may be true, as ping-pong tree sponges are carnivores that use their many spherical organs to trap and digest passing crustaceans. The sea angels' gentle personality is described as "angelic", but the common Japanese name for sea angels, クリオネ (kurione, from the family Clionidae), does not have a connection to angels, making it a less straightforward reference than it would be in English. The phrase used to describe them flying into a rage when angry, 怒髪天を衝く (dohatsuten wo tsuku), more literally means "so angry that one's hair stands on end". This may reference the way in which sea angels extend a series of tentacles from their head in order to attack prey, likening these tentacles to hair. In-game, C.Q. Cumber refers to himself as part of the denizens of the deep, but he is not included in any Twitter or Tumblr posts about them. A flip phone can be referred to as having a "clamshell" design; the phones carried by some flashlight fish may be a reference to the aquatic animal. Predatory tunicates in a subway car, along with C.Q. Cumber. A ping-pong tree sponge with C.Q. Cumber and a gulper eel. A blobfish, two siphonophores, and a flashlight fish. Two longsnout dogfish and a deep-sea jellyfish. Two gulper eels and a longsnout dogfish. Four flashlight fish with a gulper eel and ping-pong tree sponge in the background. This page was last edited on 16 December 2018, at 18:37.